February 2017. 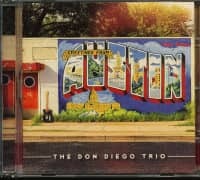 For the second time in a row, The Don Diego Trio was nominated for the “Rockabilly band” category in the Ameripolitan Awards in Austin, TX. It's the best occasion to book some shows in the Austin area, have a cultural trip and a recording session. And since, during that week, a lot of good artists and friends all over the US were in town, why not to invite them to join the band in a studio? 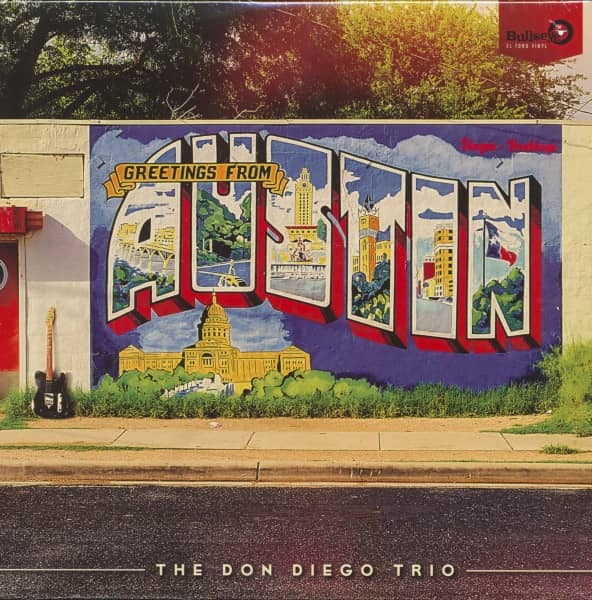 The idea of a recording session was born: a music postcard from Texas, “Greetings from Austin”. A 100% Austin sound-a-like record. There's no better studio for a honky tonk experience than the Ameripolitan Studios, right in the backyard of the Ameripolitan Awards creator:Dale Watson. A newborn studio, but already working on real country masterpieces such as, Dale Watsons recordings, the all-star Austin band Heybale (featuring Redd Volkaert, Dallas Wayne and Kevin Smith), Sophia Johnson and many others. Cris Burns is the engineer behind the recordings, the mixings and the master. He really knows how to get the real traditional honky tonk sound out of you. When he went to know what was going on, Mario Monterosso (for a long time Tav Falco's guitarist and now also in Dale Watson's band), old time friend of Diego, agreed to join the Trio for the gigs they planned. And why not to invest on the project? Born in Sicily, but actually settled in Memphis, Tennessee, he is both the artistic and executive producer of the recordings. He shares with the band his musical knowledge, live experience, vocals and guitar talent. That's the reason why the trio becomes a quartet for just this Texas week. 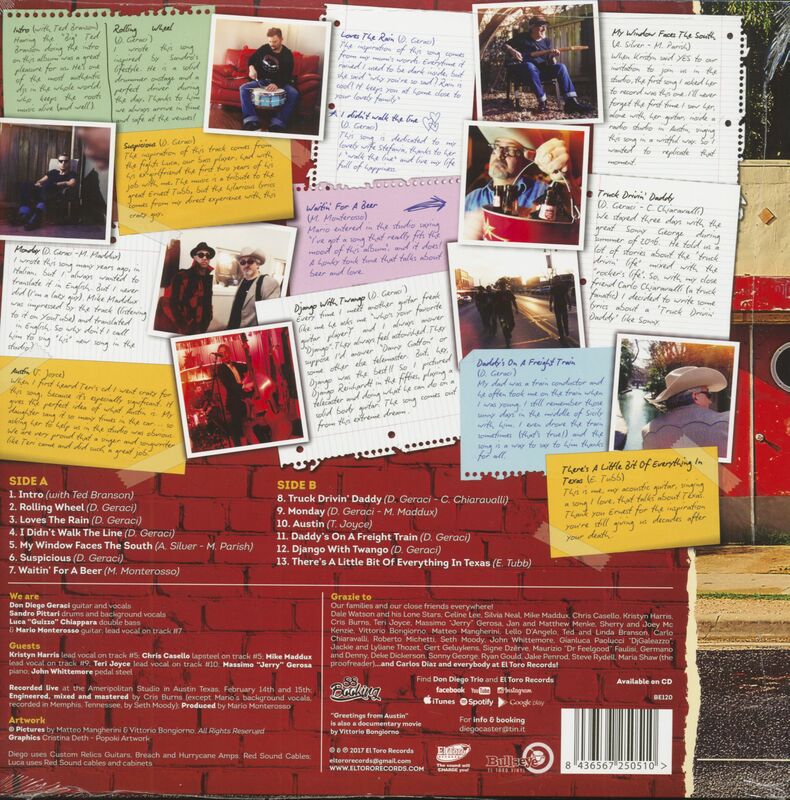 “Greetings from Austin” is a postcard. We all know the world-famous graffiti with that written on it. And this record is a souvenir from that country and of that trip. A journey shared with other friends. That's the reason why a lot of them were invited to join the session. It's the super young and talented (and 100% texans! )Kristyn Harris the first guest. She has become an affirmed star in the western swing genre and she's one of the best voices you can find. The tune she is singing comes from the Bob Wills repertoire, and it's “My window faces the south” what we are talking about. In the same song you will find the partecipation of the guitar virtuoso Chris Casello. Detroit- born and for a long time living in Nashville, he's playing two killer lapsteel solos, competing with Mario and Diego's playing. And we're proud to say that both Chris and Kristyn won the Ameripolitan 2017 Awards in their respective categories! Let's go ahead with the guests - talking about californian outlaw singer Mike Maddux. He comes from the “Ponderosa Aces” band and he's a great friend of the Trio. He sings a tune Diego wrote a long time ago in italian, that's why Lunedì becomes Monday. And the real postcard is sent by one of the most historic Austin singer: Mrs. Teri Joyce. 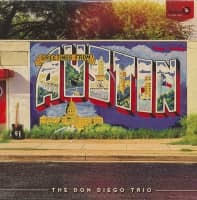 A self-penned song talking about Austin day and night life, about its pubs, venues and, of course, music! Last but not least, the record features Memphis son John Whittemore on the pedal steel and italian (but long time settled in Austin) pianist Massimo Gerosa. They all work together to realize what the real country sound is, giving the whole session a typical Honky Tonk atmosphere! Kundenbewertungen für "Greetings From Austin (LP)"